Veebeam has join a list of companies within the last month that has launched a wireless solution that steam content from your laptop or desktop PC to your Television at 1080p HD. So far we have had the Asus WiCast and HP TV Connect all offering the same functionality. According to Veebeam, Veebeam gives every broadband consumer the freedom to share their favorite content with others directly on their TV’s big screen. Easy to use – Just plug the Veebeam antenna into a laptop’s USB port and it begins streaming the desktop to the TV. Depending on what’s being viewed, users can switch between the ‘Screencasting’ mode, best for sharing websites or photos, and the ‘Play-To’ mode, to enjoy highest video quality and the ability to multi-task. Affordable – Starting at $99 USD/99 GBP/109 EUR, Veebeam lets users make the most of their existing HDTV and laptop. 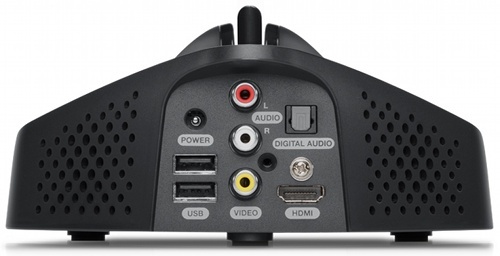 Looks great – Veebeam outputs up to 1080p video. Digital media files have never looked better on an HDTV. Compatibility – Veebeam software works on laptops running Windows 7, Windows Vista, and Mac OSX 10.5 & 10.6. Plays anything – If a PC can play it, Veebeam can play it on a TV – anything from TV shows and movies streamed on Hulu, BBC iPlayer, and YouTube, to downloaded video and personal photos. Secure wireless USB – Veebeam creates a secure point-to-point wireless connection between a laptop and a TV. Wireless USB is more powerful than traditional WiFi because it offers more bandwidth, better security and less interference in an in-room environment. The products are available in two versions, Veebeam SD and Veebeam HD. Veebeam HD includes the same composite A/V outputs as the Veebeam SD but also includes HDMI, Digital Audio and 2 USB ports.